The Moulsdale family reached out to industry experts Your Holiday Claims for specialist legal advice following their ruined November 2013 stay at the Grand Bahia Principe Punta Cana. Astoundingly, all four members suffered not once but twice during their stay â contracting both gastric illness and suffering from unpleasant insect bites. Speaking to the experts at Your Holiday Claims, 37-year-old Nicola Moulsdale claims that this melting pot of illness meant that they were only able to enjoy the first two days of their £6,000 holiday. âIt appeared we were getting bit whilst we were sleeping,â she states adding that angry red welts appeared on their limbs and were to prove incredibly uncomfortable. For the ill-fated foursome, their illness complaints were soon compounded as one by one they fell victim to gastric illness. Owing to the severity of the illness symptoms, all four members of the Merseyside family sought treatment from the pharmacy in resort. However, over the counter remedies were to prove of little relief for Nicolas sister-in-law, Lynn, who required doctor-led care at a cost of $597 for a course of injections. Nicola is certain that poor food hygiene standards at Grand Bahia Principe Punta Cana were to blame for familys gastric distress. She vividly recalls being served uncovered, lukewarm foods that appeared to be served up more than once. She also notes that flies would swarm over prepared foods in both the restaurant and snack bar. In total, all four stricken holidaymakers suffered from repeat gastric illness symptoms for ten days or more. 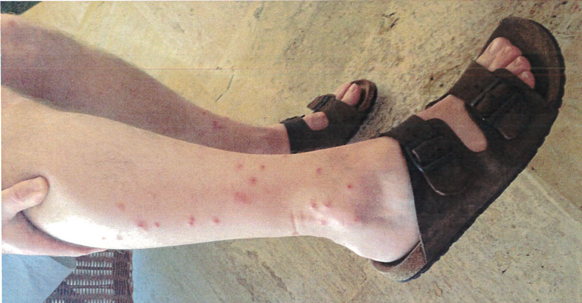 Similarly, weeks passed before the family were free from the effects of the insect bites, with this issue only resolving in mid-December 2013. Once back in the UK, the Moulsdales resolved to pursue a claim for holiday illness in the Dominican Republic, appointing Anne Thomson, head of travel law at Your Holiday Claims. Acting on a no win no fee basis, Anne handled all four claims for the stricken family, securing a total of £8,740 in a settlement with tour operator First Choice. The settlement included amounts to reflect both illnesses the family suffered. Commenting on the case, Anne said: âIt was a pleasure to assist the Moulsdale family. âUnfortunately, the Grand Bahia Principe Punta Cana remains firmly on our illness radar and we continue to hear holiday horror stories from guests who have stayed at this resort. Or, simply complete the quick holiday illness enquiry form and a dedicated Dominican Republic claims specialist will be in touch within 24 hours.